Best Stuffed Peppers with the perfect beef to rice ratio, great texture, and delicious flavor. Easy to make and can be frozen to enjoy later. Easy to make comfort food is at the center of this blog. I love a good recipe that makes delicious leftovers and also can be frozen, it makes life so much easier. You guys absolutely loved my Instant Pot Stuffed Peppers recipe and many of you asked for an oven-baked version of the recipe. 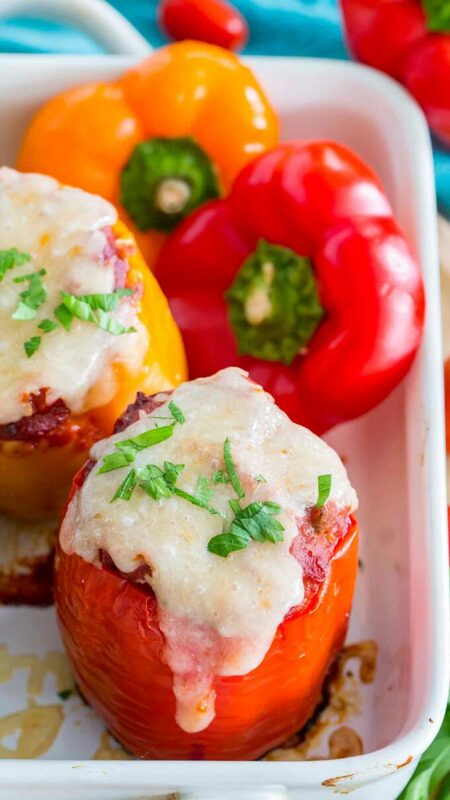 I can wholeheartedly tell you, that this oven baked stuffed peppers, are absolutely amazing. If you want to enjoy all the delicious flavors of a stuffed pepper, but don’t have the time to fix some, I highly recommend making this Instant Pot Stuffed Pepper Soup recipe. It has all the flavors you are looking for, minus the labor. Stuffed Peppers are a staple in our house as we grew up eating them a lot in Eastern Europe. My favorite way of making them is with ground beef and rice, tomato sauce and a blend of different dried herbs for extra flavor. 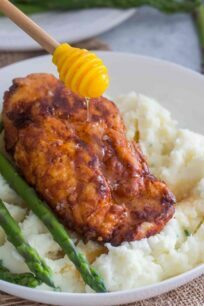 I like this recipe a lot because it can be prepared in advance, you can stuff the peppers and cook when ready. Also, the cooked peppers reheat very well, which makes for some tasty leftovers. I prefer to cook a large batch and freeze some for later. 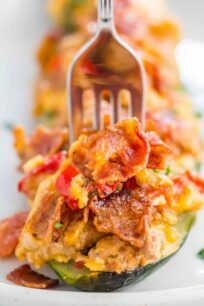 To make the peppers even more rich and delicious, you can add some cheese to the filling, or even cooked bacon! 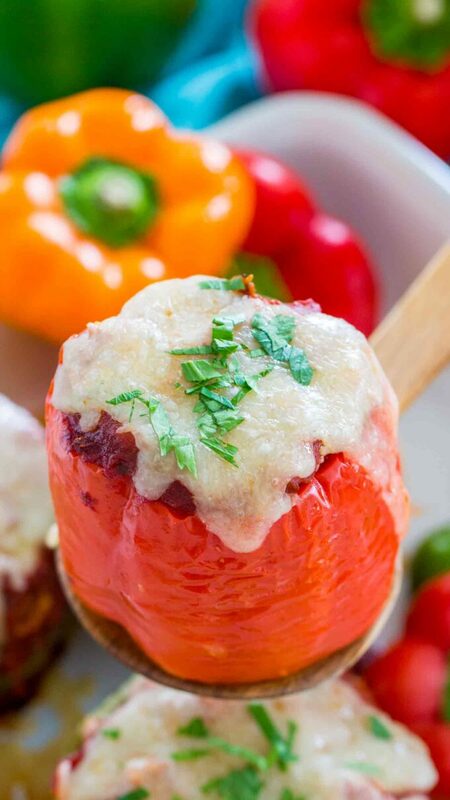 This fool-proof recipe makes some amazing Stuffed Peppers, that you will absolutely love. 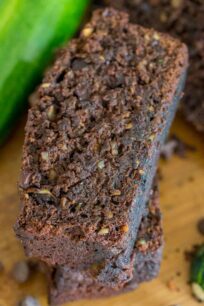 Keep reading to see different cooking methods and how can you make a vegetarian version as well. Bell Peppers – I like using different colors for a prettier dish, but for a budget-friendly meal, choose green bell peppers as they are cheaper. First, start by cooking the rice,. Also, you can use pre-cooked leftover rice. 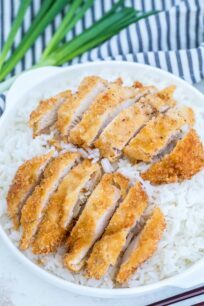 Another option is to use Instant Rice. Then, you have to wash, clean and core the bell peppers. Next step is combining all the ingredients and stuff the bell peppers. Add the bell peppers to a lightly oiled baking dish. Top the peppers with marinara sauce and bake in a preheated oven. Right before serving, sprinkle some cheese on top and broil the stuffed peppers for a few minutes. Lastly, garnish with parsley and serve. If baking in the oven – you will need to bake for about one hour until the peppers are tender, but not mushy. If cooking in the Instant Pot or other electric pressure cookers – you need to cook for 5 minutes on High Pressure followed by 5 minutes Natural Pressure Release. You can follow this recipe for Instant Pot Stuffed Peppers for all the details. If cooking in the slow cooker – cover and cook on LOW for 6 to 7 hours or on HIGH for 3 to 4 hours. You can use ground beef, ground chicken or turkey, you can also use ground sausage or a combination of beef and sausage. Stuffed Peppers with rice are delicious and great to use some leftover rice. 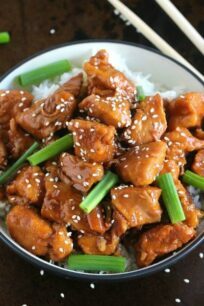 All you have to do is add cooked rice to the raw meat. 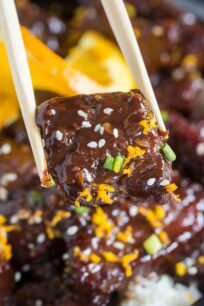 The ratio usually is 1 cup of cooked rice to 1 pound of beef, but you can tweak it based on your liking. You can always skip the rice as well and use more beef, veggies or beans. Just replace the beef with chopped mushrooms, preferably sautéed. Cooking time stays the same. You can also add more rice, or canned (drained and rinsed) beans, cooked lentils would work as well. Cooking time stays the same. Stuffed Peppers in the Instant Pot are made in a fraction of time, use my recipe for Instant Pot Stuffed Peppers to get all the details. Follow the instructions to make the Stuffed Pepper filling. Then, add the filling to the cleaned and cored bell peppers. Arrange the Stuffed Peppers in a Slow Cooker. Next, top the peppers with tomato sauce or marinara sauce. Add 1/2 cup of water to the bottom of the Slow Cooker. Cover and cook on LOW for 6 to 7 hours or on HIGH for 3 to 4 hours. Or until the ground beef is thoroughly cooked and the peppers are tender. Stuffed Pepper Soup is a delicious alternative if you don’t have the time to make stuffed peppers. I have a very easy to make recipe, that will be ready in just 30 minutes, check this Instant Pot Stuffed Pepper Soup recipe. Refrigerate the peppers in airtight containers or resealable plastic bags. Properly stored, cooked stuffed peppers will last for 3 to 5 days in the refrigerator. First, add the peppers to a freezer-safe dish. Next, cover well in aluminum foil and then wrap the dish fully in plastic wrap or better if you have freezer wrap. Make sure the dish is fully covered in a wrap to avoid exposing the peppers directly to the cold. You can also freeze each pepper individually by wrapping it in plastic wrap or better in freezer wrap and adding it to a freezer bag. Properly frozen the peppers can be stored in the freezer for up to 3 months at 0 degrees F or less. Fully cook the Stuffed Peppers, and if you intend on freezing them, do not top with marinara sauce and cheese. Also, fully cool the cooked peppers before freezing. Add the peppers to a freezer-safe dish. Cover well in aluminum foil and then wrap the dish fully in plastic wrap or better if you have freezer wrap. Make sure the dish is fully covered in a wrap to avoid exposing the peppers directly to the cold. It is best to thaw peppers in the refrigerator for several hours before cooking, this will ensure uniform baking in the oven. Then, remove the wrapping from the peppers and add them to a baking dish, leaving enough room between them. Next, top each pepper with marinara sauce. Bake for about one hour, until peppers are tender. Use a fork to taste the stuffing, to ensure that it has been cooked through. If you have time, thaw peppers in the refrigerator for several hours before cooking. It’s ok if you don’t, you can cook frozen peppers as well. Remove the wrapping from the peppers and add them to a baking dish, leaving enough room between them. Then, top each pepper with marinara sauce. Next, bake for about 20-30 minutes for frozen peppers or until heated through and about half the time for thawing. Use a fork to taste the stuffing, to ensure that it has been heated through. 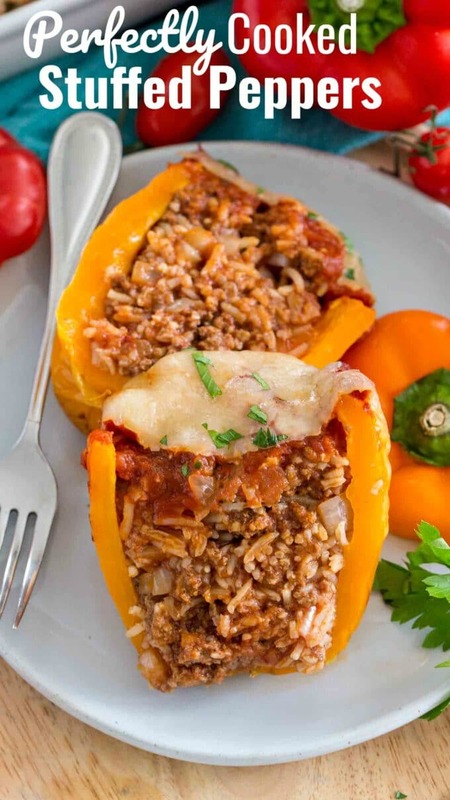 Best Stuffed Peppers with the perfect beef to rice ratio, great texture and delicious flavor. Easy to make and can be frozen to enjoy later. Add the rice and water to a medium saucepan, and bring to a boil. Reduce heat, cover, and cook 20 minutes or check rice package for cooking time. Wash the peppers, cut off their tops (I like to keep them to use when serving the peppers), remove the seeds and clean the inside well by removing gently all the veins. If needed, cut the bottom of the peppers just a little, in order to level it, so the peppers can stand straight in the baking dish. 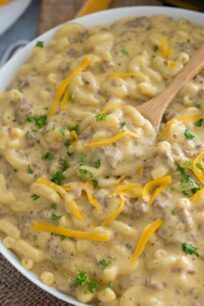 In a large bowl combine all the ingredients starting with the ground beef - up to the chopped parsley. Stir well to fully combine. If you have time, you can also brown the beef in a skillet before adding it to the mixture. This adds extra flavor, but dirties another pan. Both ways, the peppers will turn out delicious. Spoon an equal amount of the mixture into each hollowed pepper, and arrange them in a very lightly oiled baking dish with the hollowed sides facing upward. Top each pepper with a few tablespoons of marinara sauce. Bake in the preheated oven, basting with the remaining sauce every 15 minutes, until the peppers are tender. Top the peppers with shredded cheese and broil for just a few minutes right before serving. My husband and I enjoy eating stuffed peppers and they freeze well to be made later which helps. Wish the kids did more than just eat the filling. I remember my parents eating these when I was a child. Although for me I don’t think I have ever had them and not being sure if I would like them or not it’s time I at least give them a try. Thanks for including instructions on how to cook both frozen cooked and uncooked stuffed peppers. I always worry about overcooking stored frozen uncooked foods. I do love me some stuffed bell peppers! Haven’t done it in awhile, but you have me wanting to! I love stuffed peppers! They are probably one of my favorite dinner! 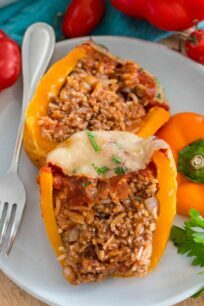 I love seeing the different varieties that you can make with stuffed peppers! It is so great that you can make stuffed peppers in so many different ways and for anyone with a slow cooker or instant pot. I will keep this recipe for when it cools off and comfort food takes over. Stuffed peppers is a favorite in my home. I can’t wait to give this recipe a try. These look just like the ones my mom made when I was a kid. I always loved the stuffing, but not the peppers. Then I grew up and realized I could use red or yellow peppers and they weren’t as bitter, and now I love them! I love stuffed peppers and I made some this summer when our peppers were coming in fast and furious. I am loving that you recommended soup if you wanted to save time! I’m a big fan of stuffed peppers, and honestly your recipe looks sooo good! I’m going to have to try this, as the ones I made were a lot different than this. 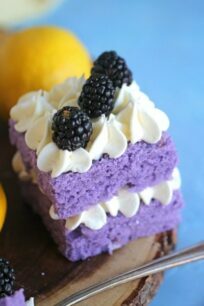 Those look so good. My kids have been asking me to make them stuffed peppers lately and I’ve been looking for a good recipe. I believe I’ve found it! My stuffed peppers never look this good! Wow! I’ll have to try your way to see if I can get better results. My daughter has always loved stuffed peppers since she was a toddler. Your recipe looks fantastic. 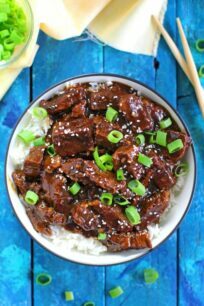 I love cooking this dish in the slow cooker. So many different ways to make peppers that I cannot choose just one. All of these recipes are Mmmmm especially the soup on a rainy cold day. These stuffed peppers look like they would be easy to make, delicious to eat on a weeknight or weekend. Seems like they would freeze well too! Mine never manage to look that good. I love how you have included multiple means of cooking. I have never had stuffed peppers before but your recipe looks really good. I really appreciate that you shared more than one way to make stuffed peppers. I love to cook food in my slow cooker but I want to pull my instant pot out. I think I will try that recipe. 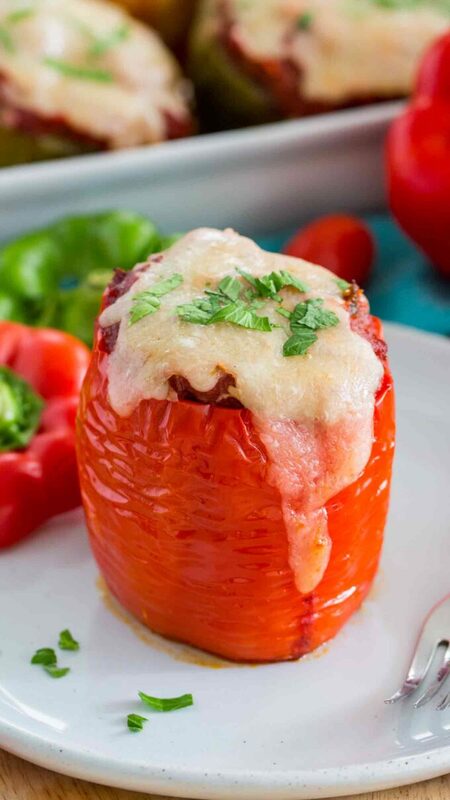 Stuffed pepper looks delicious I love stuffed pepper that cheese on the top is really nice.